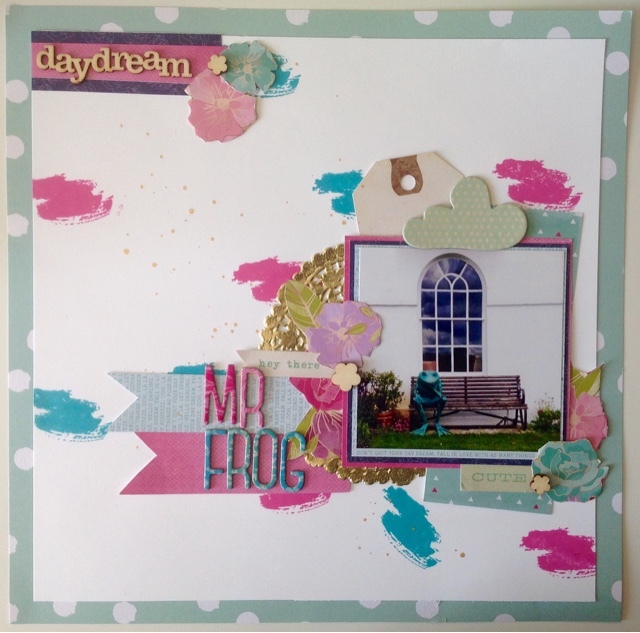 As I said in my last post I didn't get many layouts done for National Scrapbooking Day but I'm happy with the ones I did. 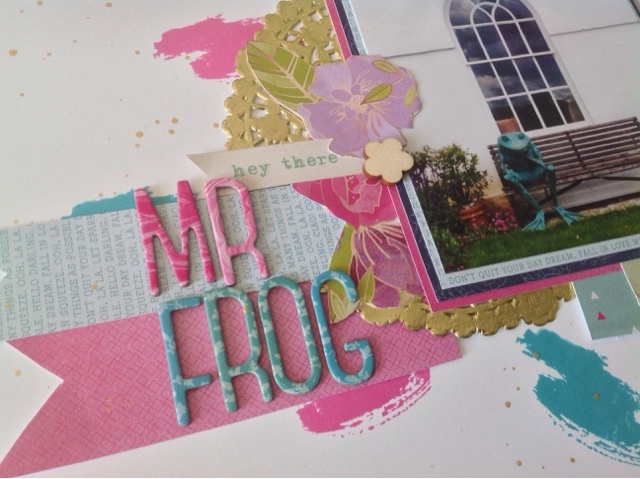 The first challenge I did was for Challenge over on For The Love of Pretty Paper Facebook page. The challenge was to use flowers on our layout. Now I'm not much of a flower person, I brought a ton of Prima Flowers when I started scrapping (I'm sure I wasn't alone) but since gave these away as I just didn't use them. Thinking out the box I started looking for some floral paper to use as a paper layer but then I decided instead to fussy cut some flowers out instead. I'm not the best at fussy cutting, I keep my scissors still and move the paper like you're supposed to but I still end up with sharpe square edges instead of lovely flowing curves following the pattern! I found a gorgeous floral paper in Dear Lizzy's Serendipity collection and went from there. I chose a random photo of a frog I used to pass on my way to work when I worked in town. The title is Hey There Mr Frog as this is what I used to say to him as I passed him. I pulled more papers and the Thickers from the same collection to make sure everything tied in. I thought the white background was a bit plain so went made and stamped some brush strokes from a Stampin Up set in Picked Raspberry and Mermaid Lagoon, I probably went a tad OTT but never mind. I think thats lovely, love the colours :) Im the same with cutting, even bought fancy scissors but still doesnt work!